Facebook Live Tutorial, Scam Alert, More! Jumping down a waterfall into choppy waters? Not a problem for these daring kayakers, who tackle Idaho's Caldron Linn Canyon. Darci Lynne, just 12 years old, wows America's Got Talent judges with her act, prompting the rare Golden Buzzer honor. When 3 Rivers refers to VoIP (Voice over Internet Protocol), we’re not talking about a voice service that travels over the open Internet like Vonage or others you may know. Here is some information to help understand what role VoIP plays in 3 Rivers’ network and how we provide high quality voice service using this technology. We have, in fact, been using VoIP for years. IP stands for Internet Protocol and is actually the method of transmitting information that all modern systems use to carry 99% of all POTS (plain old telephone service), cell phone calls, text messages and video. IP is simply the underlying technology. When first introduced, services such as Vonage bypassed the traditional toll telephone network to allow users to place long distance calls inexpensively. These calls were carried on the open Internet and were known at the time for less than ideal quality. 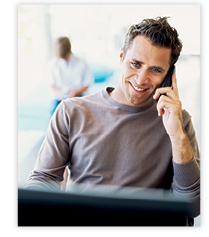 3 Rivers use of VoIP has little in common with Internet-based VoIP. IP packets carrying a 3 Rivers phone call initiated in Browning made to Big Sky, for example, never travel across the open internet. They stay on 3 Rivers carefully maintained network of routers to ensure voice quality is maintained. However, just like with Internet content, once voice calls leave 3 Rivers’ network we have no control over their quality. Currently, most voice traffic leaving 3 Rivers as a VoIP call goes out to other carriers on older, legacy connections, and is no longer VoIP. Sometimes, low budget long distance companies might convert the call back to VoIP and carry it on another private IP network like 3 Rivers, or on the open Internet, possibly leading to quality issues. In the future, most traffic leaving our network will remain VoIP all the way to the customer, avoiding legacy connections entirely. Goodbye loyalty card clutter! Hello safe card organization, nearby deals, convenient shopping lists, and favorite sales. Make your great photos even better with features that allow you to adjust, brighten, and color images, then easily share them. Get a free crossword each day and choose your difficulty level. The app saves unfinished puzzles so you can continue later. Shark Week starts July 23 on Discovery. Dive into the details. If you haven't started pinning on Pinterest yet and want to get started, click here. consumer.ftc.gov – Want to know more about consumer issues? Visit this site, which is packed with information about filing a complaint, credit reports, identity theft, and more. Also, explore the sections on homes and mortgages, health and fitness, and avoiding scams. allrecipes.com – Salads aren't just side dishes any more. This site offers dozens of main dish salad recipes, perfect for summer dinners. Not convinced? You will be when you try Caprese Salad with Grilled Flank Steak or Grilled Chicken Taco Salad. Make enough to have leftovers for lunch the next day! discoverboating.com – Boating is one of those great pleasures that typically only happen in summer. But, before you get on the water, visit this site for safety tips like checking the weather and following a pre-departure checklist prior to setting out. Those with pets or kids will find sections devoted to their well-being. planitdiy.com – Have a home improvement idea but no clue where to start? This helpful site provides how-to videos on a range of projects including plumbing, electrical, home safety, heating and cooling, lawn and garden, and more. The videos are easy to follow and much cheaper than hiring a professional. Short Tutorial/FAQ – How Do I Use Facebook Live?